As the name says, Vibro Screen is used for screening of both wet and dry materials. The task of the Vibro screen is to separate liquid from powder. Vibro screens are widely used in food, minerals and metals, engineering, ceramic, dairy industries, soap and detergent industries, agro, paper and pulp industries and in much more. 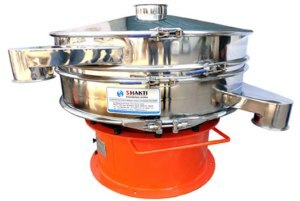 Our designed Vibro screen machines are highly adaptable to different materials and processes thus our Vibro screen machines can be used for various purposes such as removal of dust, separation, grading, and classification of various materials such as seeds and grains, removal of oversized particles or lumps, shifting and screening of powders and liquids and much more. Our Vibro screens are used in various industries and labs to do various tasks. Our Vibro screens are highly versatile used for various operations such as separation and shifting. The material fed on the screen as per the particle size and nature. Our Vibro Screens are highly durable and reliable makes these a great choice for one. This entry was posted in Screening and Separation Machinery and tagged Vibro Screen, Vibro Screen Manchine, Vibro Screen Manufacturer India, Vibro Screen Separator, Vibro Screen Supplier, vibro screens. Bookmark the permalink.